For the first few months of living in our home, something bothered me whenever I walked in the door. There was nothing inviting about my entryway, in fact I didn't have much of an entry way at all. Entryways are the first thing guests see when they walk in your house so they should feel inviting and make a nice first impression. But I didn't have an entry way. All I had was this boring beige boxy area that wasn't welcoming and made no statement other than "we're boring!" Not the impression I was looking to make! Even worse, my entryway wasn't functional. There was no place to easily drop shoes, bags, or jackets. Plus, I like for everyone to take off their shoes when they walk in my house so I wanted something in the entry way to signal to guests that they should do so without me having to ask. 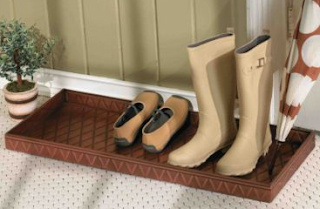 I started brainstorming entry way ideas and thought a nice boot tray would do the trick of politely suggesting to guests that they should remove their shoes. 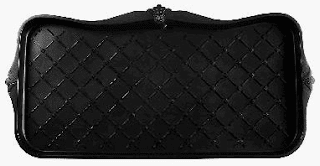 I found this nice boot tray with a fleur-de-lis pattern from Ballard Designs but didn't want to shell out $49 for something to hold my shoes. So I decided to make one myself. I bought this scalloped boot tray from WalMart in beige. It looked plain, but the shape and design had a lot of potential (picture it in a bland tan/beige color). 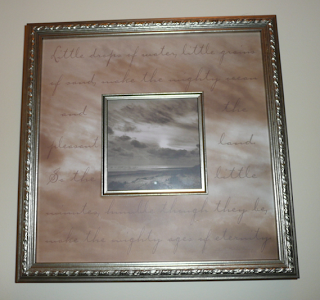 I spray painted it a warm brown Rust-Oleum textured stone finish spray paint. The spray paint gives it a much more finished look. And for about $5 I have a tray that looks a lot like the $50 on from Ballard Designs. But I still needed to add storage for jackets and other items. Since my entryway is pretty small, many traditional coat hooks and entryway shelves and cubbies were to wide and would have prevented the door from opening all the way. 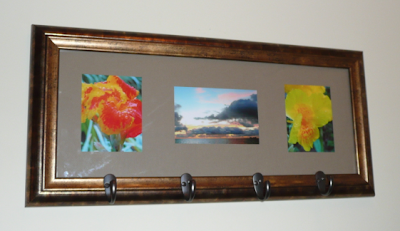 So I decided to make a diy coat rack out of a picture frame. Check out my step-by-step guide on how I made this diy coat hook rack. The boot tray and coat hooks added some much needed storage and functionality. To add some style, I added an art piece I picked up at Christmas Tree Shops to decorate the space. 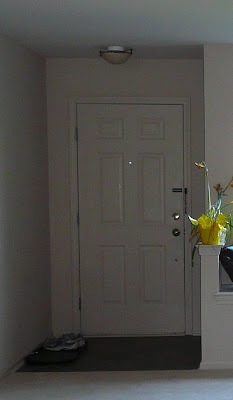 To complete the redesign, we painted the entry way the same color as the adjoining living room- a warm, inviting yellow. 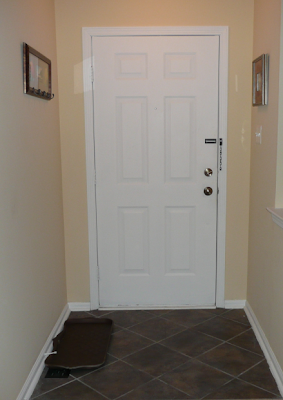 The door and trim was painted white to add a finishing touch to the walls. Tada! A functional, stylish, inviting entryway! I'm sharing this project on Diy Day, Thrifty Thursday, Transformation Thursday, Metamorphosis Monday. Love that boot tray! I'm gonna look for one next time I'm out. Thanks for sharing! You have a nice and inviting entryway now. The boot tray is a great idea. Never even heard of a boot tray. Not sure my kids would manage to keep the shoes in it. They pile AROUND the basket I have out for that purpose. neat idea. I like your boot tray even better than the ballards!! What section did you find the tray in? LOVE this project! Thanks for linking up in Thrifty Thursday this week! Great project! I think you have successfully made a welcoming entryway! Great ideas for future projects! Great great job!! 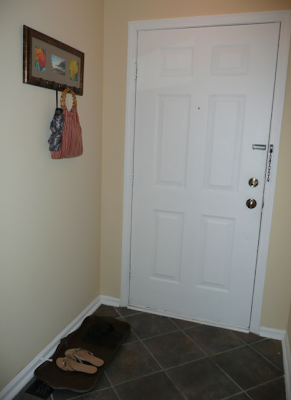 I'm so glad that you painted the entryway, that really helps make a big impact and make those DIY projects POP! That looks really cute! Good job! This is charming.... and your boot tray is fabulous! Now that is excellent thrifting skills you put to use there, and I like YOURS better than the Ballard's design. Love your inspiration picture! Nice job. Thanks for all of the comments, I'm glad everyone enjoyed my entryway redesign! Check out my guide to making a diy coat hook. I love the boot tray! Great job!! You did a great job - I love it more than the Ballard one! We have that boot tray - and I hated it, but now I think it just needs a coat of spray paint - thanks for the idea! I love it--SO the question is WHERE IN WALMART DO THEY SELL THE BOOT TRAY? I haven't seen those before.??? I like your yellow walls and all your ideas were very clever and clever use of space! I can't remember where I found the boot tray in WalMart, I think it was in the tools/housewares section, but I can't remember for sure. I'm flattered everyone likes it so much, next time I'm in WalMart I'll take note of where I found it and I'll post more specific information about how to create the boot tray. Thanks for everyone's interest! The boot tray is very cute! Thanks for sharing!